What is Planet Formation Imager (PFI)? Among the most fascinating and hotly-debated areas in contemporary astrophysics are the means by which planetary systems are assembled from the large rotating disks of gas and dust which attend a stellar birth. 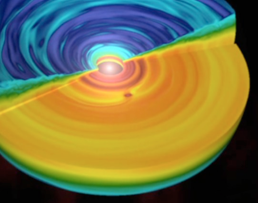 Although important work is being done both in theory and observation, a full understanding of the physics of planet formation can only be achieved by opening observational windows able to directly witness the process in action. The key requirement is then to probe planet-forming systems at the natural spatial scales over which material is being assembled. By definition, this is the so-called Hill Sphere which delineates the region of influence of a gravitating body within its surrounding environment. 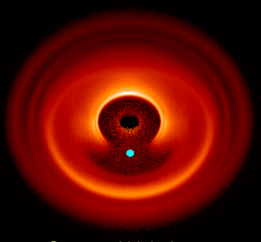 The Planet Formation Imager project has crystallized around this challenging goal: to deliver resolved images of Hill-Sphere-sized structures within candidate planet-hosting disks in the nearest star-forming regions. Solving the riddle of planetary formation has profound and far-reaching implications beyond astronomy, for it helps inform our place in the universe and expectations for life on other worlds. PFI was born in late 2013 and an international consortium has rapidly emerged to develop realistic project goals, with participants drawn mainly from the high resolution astronomical imaging community. Scientists from more than a dozen different institutes in six countries are presently on the project launch committee, led by Project Director John Monnier (U. Michigan), Project Scientist Stefan Kraus (U. Exeter), and Project Architect David Buscher (U. Cambridge). Our top priorities for the next 12-24 months is to define the most exciting areas of science to drive the instrument concept and at the same time determine feasible architectures for meeting the science goals. See below (“How can I get involved”) for how you can participate in the Science Working Group or the Technical Working Group. To support the administration of the project and to advise the Project Director, we are now formulating a Project Advisory Committee (PAC) that will represent major science constituencies, technical leaders, and institutions able to provide tangible support to PFI in the initial concept design stages. The PAC is ultimately responsible for electing the executive leadership of the PFI project and will meet regularly with the PFI leadership to discuss progress and strategy. If you are interested in becoming a member of the PAC, please send a cover letter explaining your motivation and qualifications along with a CV to pac_membership@planetformationimager.org. The best time to get involved with PFI is now. At present, the only constraint on the scientific mission for PFI is that it provides transformative planet formation breakthroughs. Further detailed requirements and science goals are yet to be developed. What wavelengths and spatial scales will be key for PFI? What different aspects of planet formation can we learn from scattered light, thermal IR, or mm-wave imaging? What are the optimal diagnostic lines to determine the physical conditions and kinematics in the circumplanetary accretion disk? Which nearby star-forming regions are the most important to survey? 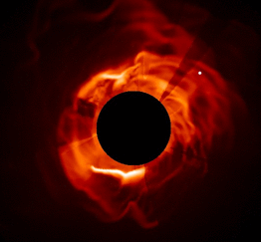 Can PFI also detect the panoply of warm exoplanets expected to be around most young stars? We consider all technologies and facility architectures that might be capable of achieving our science goals, including visible, thermal infrared, and mm-wave capabilities. Can PFI achieve the desired sensitivity from the ground or will a space platform be needed? What kinds of imaging technologies are capable in principle of meeting the project science goals? Our goal is to answer all these questions over the next 12-24 months. Scientific Working Group: The SWG is led by the Project Scientist and is critical for developing and prioritizing the key science goals of PFI. It has been charged with investigating the signatures of planet formation at different stages of disk evolution, assessing the properties and observability of the protoplanetary bodies, and studying how a suitably specified PFI could significantly advance our understanding of the architecture and potential habitability of planetary systems. The SWG is responsible for developing and maintaining the Top-Level Science Requirements (TLSR) for PFI and these high priority science topics will be published in white papers and refereed journals when appropriate. Scientists from the star formation, planet formation, planetary science, and exoplanet community are kindly invited to contribute to our efforts. If you are interested in joining the SWG as an official member, please outline your experience and motivation using our web form. Technical Working Group: The TWG is led by the Project Architect and oversees the development of PFI Concept Studies that could meet the Top-Level Science Requirements (TLSR), providing critical feedback to the PAC/SWG as to the likely technical and cost implications of different science goals. At this early stage of the project, the TWG has been charged with exploring a range of potential technologies and evaluate which might be critical for the success of PFI. The TWG will develop and maintain a Technology Roadmap and internal studies will be published as white papers and submitted to refereed journals where appropriate. If you are interested in joining the TWG as an official member, please outline your experience and motivation using our web form. When might PFI be built? We hope to answer that question with more confidence within 12-24 months following the work of the Science and Technical Working Groups. Realistically, most of the us involved in PFI recognize that while the ambitious goals of PFI are definitely achievable, they will not be easy to meet with current technologies at a modest price point. However, we are confident that with a clear and strong design reference mission and a well-defined technology roadmap, a feasible timescale for PFI will be one that envisions deployment sometime after the Extremely Large Telescope (ELT) Projects are fully operational in the late 2020s. ‣What is Planet Formation Imager (PFI)? ‣What is the status of the project? ‣How can I get involved? ‣When might PFI be built?